In this episode of The Skinny On Sports Show on Blog Talk Radio I discuss the NBA Playoff, Roy Hibbert, NASCAR, and the Washington Nationals! Check it out! The Skinny On Sports Show 06/02 by The Skinny On Sports Show | Blog Talk Radio. If there is one thing that is completely wrong with NASCAR, it is its governing body. Personally, fair is not a word that I would use to describe NASCAR when it comes to penalizing and disciplining it’s participants and teams. Just a couple weeks ago, Joe Gibbs racing driver Matt Kenseth was fined 50 driver points for failing inspection for a part that came up short of its required weight by 2.7 grams. On top of that, Gibbs was fined 50 owner points and Kenseth’s crew chief, Jason Ratcliff, was suspended for seven races and fined $200,000. The team is currently awaiting the results of an appeal. A more prominent and noticeable discrepancy in NASCARs governance comes on the track…and more specifically at the end of the race. In yesterday’s Nationwide Series race at Talladega, there was a multi-car wreck that happened as the field entered the tri-oval coming to the checkered flag. At the front of the field, Regan Smith dove from the top lane to the bottom and was door to door with Joey Logano and about 200 yards from the finish line. On the high side, Kasey Kahne came hard-charging looking to take the lead and steal the victory. Joey Logano was sandwiched in the middle side-by-side with Smith. The trio raced to the finish line and it was too close to call with the naked eye as to who won. Most believed that Kahne had crossed the finish line first. While the drivers sat on pit road awaiting the final results from NASCAR, it was announced that Regan Smith had won the race since the caution was thrown before the trio had crossed the finish. At the most recent scoring loop following the immediate caution, it was determined that Smith was in first. 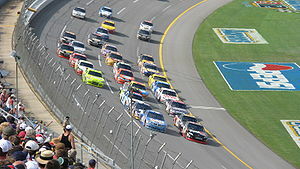 Since it was a green-white-checkered finish, the race was deemed over as soon as the caution was thrown. The final running order went Smith in first, Logano in second, and Kahne in the third. As you might’ve guessed Kahne was a little perplexed. NASCAR has had quite a history when it comes to this situation. Unfortunately, history hasn’t always repeated itself. We can look back on the 2007 Daytona 500. As the field exited turn number four, Kevin Harvick and Mark Martin were side-by-side heading to the tri-oval and the finish line. The field began to wreck behind them and NASCAR let them race to the finish. However, had a caution been thrown at the time of the wreck, much like yesterday, Mark Martin would have won the race. Since a caution was never thrown, Kevin Harvick beat Martin to the line and won the race. Flash forward to yesterday and, once again, the decision of NASCAR had a direct impact on the outcome of a race. Rather than letting the field, or what was left of it, race back to the line, they threw the yellow flag and froze the field at the point the caution was thrown. Doing so gave Regan Smith the win. NASCAR needs to find some form of uniformity for when and when not to throw the caution at the end of the race. If you look at the replay of the end of the race, by throwing the caution they weren’t saving any cars from getting caught up in the accident. There were no cars left in the field! In most other sports, the governing body has a rule book to go by when it comes to disciplining its participants. In NASCAR, it seems as though they penalize based on how it makes them feel when they think they’ve been outsmarted. It’s time for NASCAR to join the rest of the sports world go by the book when it comes to penalizing its participants.